As we remember Hurricane Katrina, sigh in relief at Tropical Storm Erika, which took lives in the Caribbean before dissipating south of Florida, worry about Hurricane Fred as it threatens Cape Verde in the Atlantic, and ponder the three hurricanes that briefly churned simultaneously in the Pacific, I am reading about Hurricane Ella. 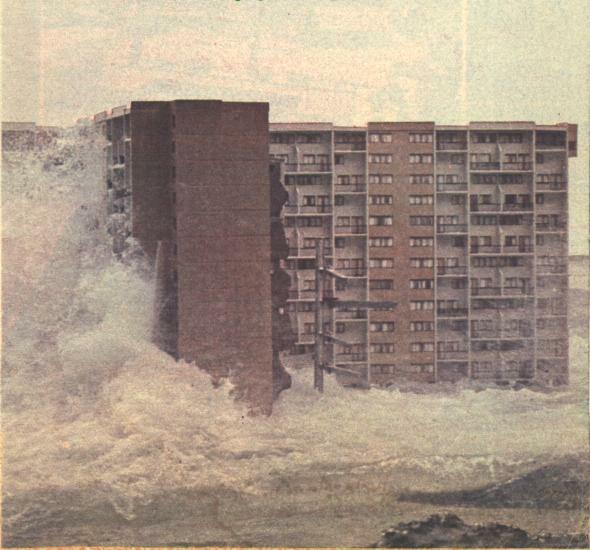 I am reading John D. MacDonald’s Condominium, published in 1977, which is about a poorly built condominium complex and its deplorable management as its owners scramble to get rich (then avoid legal trouble) during a major downturn in the climate for condos in mid-’70s Florida. Halfway through the long novel, Hurricane Ella rears its ugly head and, well, I’ve not got much farther than that. The novel is supposed to be riveting as Ella bears down on a string of condo complexes along the Gulf Coast. Of course, the real Ella did not show up until 1978. It glanced off North Carolina’s Outer Banks and then became the biggest hurricane ever to hit Canada (but did little damage by then). Still, a passage from Condominium reminded me of the thinking of University of Texas architectural theorist Nikos Salingaros in regard to the parallels between old architectural practices and the processes of reproduction and development in nature. Normal cadence of the Atlantic waves breaking on these shores is eight per minute. The great oncoming storms slow that cadence to five and six per minute. This change in the constant, unremarkable sound of the sea is the ancient alert for all living things. … The wind and rain had not yet begun along [the] barrier islands. The radios had not yet broadcast warning to them. But people could see the hurakán bands in the sky and hear the slow sea, and it quickened pulses, created a bowel flutter of queasy anticipation. The more primitive the island area, the more practiced and practical were the preparations, and the more suitable the structures to the great force oncoming. This is not to argue that, as the climate becomes more dangerous, societies around the world should strive to recapture their inner primitive. But it is to argue that designs for human habitation that arise over centuries are better at coping with what nature throws at us than designs that are conceived as reflecting “our era” – the new! the now! the novel! – designs that reject the long-gathering wisdom of time. This entry was posted in Architecture, Architecture Education, Architecture History, Development, Urbanism and planning, Video and tagged Biophilia, Condominium, Florida, Hurricanes, John D. MacDonald, Nature, Neurobiology, Nikos Salingaros, Tourism, Vacation, Video. Bookmark the permalink.